So far in the time value of money chapter, we have focused solely on the future value of a lump sum payment or present value of a single cash flow expected to be generated in the future. 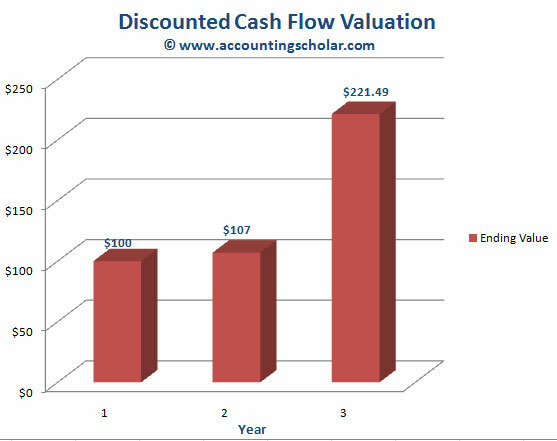 However more often than not, these valuations include multiple cash flow payments in the future. How do we account for those? For instance, if McDonalds is planning to open a new store, there will probably be a large cash outflow (investment) now and lots of cash inflows for many years in the future. In this chapter, we begin to explore investments of this nature. The table above is a financial time line that literally draws the process of calculating future value of these two $100 deposits in a format that is understandable by anyone. Drawing diagrams like this for solving complicated cash flows & future cash flow questions can be very helpful. This graph above shows the growth of $100 in year 1 to $221.49 in 2 years after making another $100 deposit in year 2, and earning an annual rate of return of 7% compounded annually. Thus, $221.49 is the ending balance of year 2, or beginning balance of Year 3. 2) Calculate the future value of each cash flow first, and then add them up.